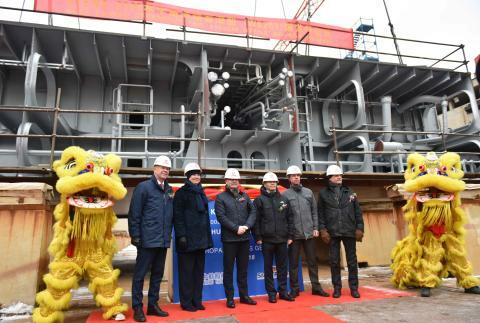 On Friday 2 February 2018, the official keel-laying ceremony took place at the AVIC Weihai Shipyard in China. This traditional maritime event marks the start of the construction phase of the hull and the exterior parts of the vessel. 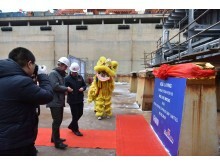 “This is an important milestone in our exciting new ship building project”, said Niclas Mårtensson, CEO Stena Line, who also took part in the traditional Coin Ceremony where 4 coins (GBP, EUR, SEK and RMB) where placed under the keel-block as a symbol of good fortune. 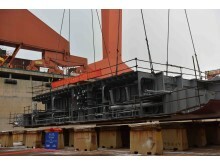 The new vessels have a planned delivery timetable during 2019 and 2020. They will be 50% bigger than today’s standard RoPax vessels and this significant investment illustrates a continuation of Stena Line’s successful RoPax concept which mixes freight and passenger traffic as part of its operational business model. “Our overall target is that these vessels will be the absolute state-of-the-art when it comes to energy efficiency, flexibility and customer service. In particular, we are placing heavy emphasis on developing a range of exciting new digital features which will provide our customers with unique additional services connected with their journey as well as developing a new, integrated digital onboard experience”, said Niclas Mårtensson. The new RoPax vessels will be deployed on the Irish Sea and represent a key strategic investment to continue to further strengthen Stena Line’s business in the region. “We have a positive outlook on the future and foresee continued growth within ferry transportation so this is an important strategic step in helping us to prepare our business to leverage that anticipated growth”, concluded Niclas Mårtensson. Stena Line is one of Europe's leading ferry companies with 38 vessels and 21 routes in Northern Europe. Stena Line is an important part of the European logistics network and develops new intermodal freight solutions by combining transport by rail, road and sea. Stena Line also plays an important role for tourism in Europe with its extensive passenger operations. The company is family-owned, was founded in 1962 and is headquartered in Gothenburg. Stena Line is part of Stena AB, which has about 15 000 employees and an annual turnover of over 35 billion SEK.